Book News: Jane Goodall Apologizes For Lifted Passages In Her New Book : The Two-Way Also: Vladimir Nabokov's classroom rules; Condoleezza Rice is writing a book; a photo essay featuring Shakespeare & Company. 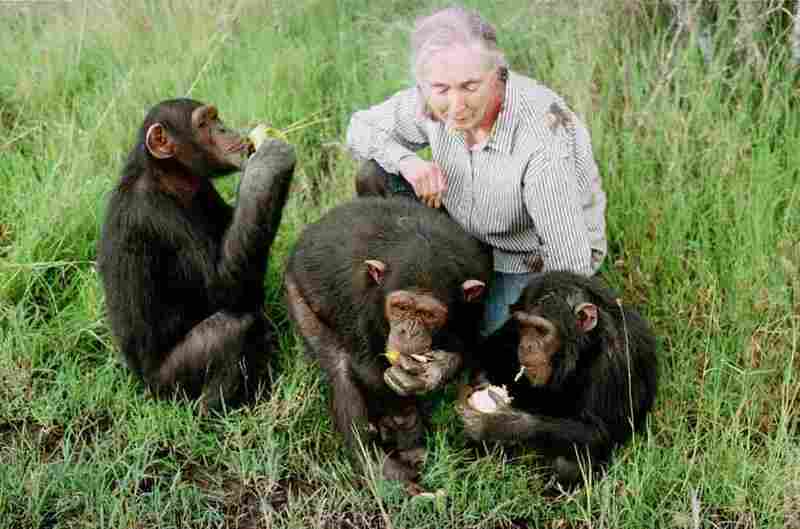 Primatologist Jane Goodall observes chimpanzees in 1997 at the Sweetwaters Chimpanzee Sanctuary near Nanyuki, north of Nairobi, Kenya. A new book from prominent primatologist Jane Goodall "contains borrowed passages without attribution," according to a report in The Washington Post. The book, Seeds of Hope: Wisdom and Wonder From the World of Plants, is due out next month and was co-authored by Gail Hudson, who worked on two of Goodall's previous books.. The Post alleges that the "borrowings ... range from phrases to an entire paragraph from Web sites such as Wikipedia and others that focus on astrology, tobacco, beer, nature and organic tea." Goodall did not contest the allegations, telling the Post in an email that she was "distressed to discover that some of the excellent and valuable sources were not properly cited, and I want to express my sincere apologies." Seeds of Hope publisher Grand Central expressed surprise, telling the Post: "We have not formulated a detailed plan beyond crediting the sources in subsequent releases." Photography magazine Fotopedia has published a stunning photo essay of the famous Paris bookstore Shakespeare & Company, the haunt of writers Ernest Hemingway, F. Scott Fitzgerald, Gertrude Stein, Ezra Pound and others. Former U.S. Secretary of State Condoleezza Rice is coming out with a book, according to a press release Tuesday from Henry Holt, her publisher. It says Rice's book will focus on "the never-ending process of building democracy as citizens — and their governments — strive to attain and secure the ideals of self-rule." Edward Jay Epstein writes in The New York Review of Books about taking a class with Vladimir Nabokov (paywall protected): "He made it clear from the first lecture that he had little interest in fraternizing with students, who would be known not by their name but by their seat number. Mine was 121. He said his only rule was that we could not leave his lecture, even to use the bathroom, without a doctor's note." Poet T.R. Hummer on Walt Whitman: "The poetry is so vast, so manifold — and exists in so many revised forms — that Whitman is the American poet most like the fabled elephant as described by blind witnesses, each touching a different part of the creature thinking it to be a wall or a snake." Google's Eric Schmidt and Jared Cohen write about the computer worm that attacked Iranian nuclear facilities in a passage from their forthcoming book, The New Digital Age: Reshaping the Future of People, Nations and Business: "When we asked the former Israeli intelligence chief Meir Dagan about [the Stuxnet collaboration], his only comment was, 'Do you really expect me to tell you?' "